Cloudy skies with a few showers after midnight. Low 47F. Winds light and variable. Chance of rain 30%..
Cloudy skies with a few showers after midnight. Low 47F. Winds light and variable. Chance of rain 30%. The City humorously added that they are also "investigating what that bright yellow thing in the sky is." 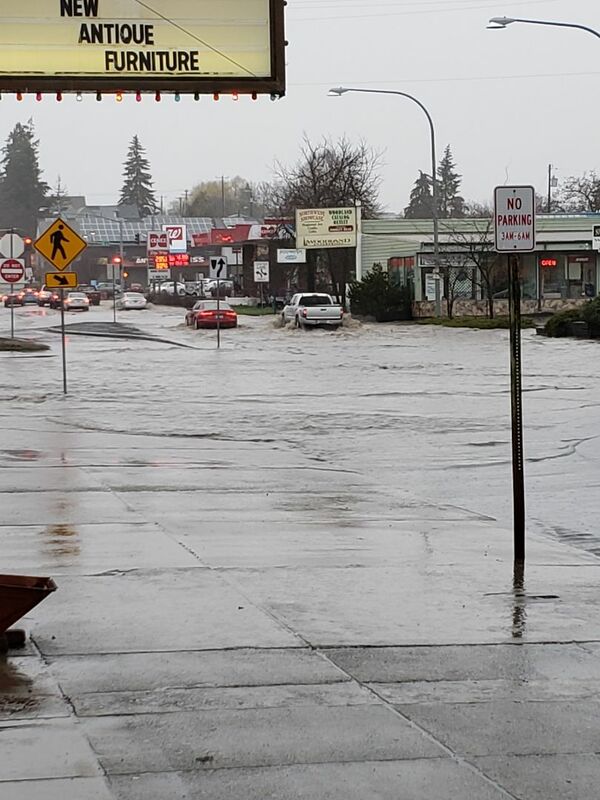 UPDATE: April 10, 2019 5:00 a.m.
KHQ's Stephanie Stevenson reports that Grand Ave. is now open in Pullman after flooding the major road Tuesday night. City crews will be conducting a sweep of the street Wednesday morning. KHQ's Noelle Lashley tweeted out photos showing flooding damage at a SNAP fitness in Pullman on Grand Avenue. Tuesday night's flooding is the worst the area has seen since 1996. UPDATE: April 10, 2019 3:30 a.m. The National Weather Service in Spokane has issued a Flood Advisory for west central Latah County in north Idaho and east central Whitman County on the Palouse until at least 7:00 a.m. Wednesday as flooding continues along Missouri Flat Creek as well as near the South Fork of the Palouse River. Law enforcement in Latah County is also reporter minor flooding occurring near Paradise Creek in Moscow. The Latah County Sheriff's Office urged residents that don't need to be out on the roadways on Wednesday to stay home until crews have an opportunity to make sure the roads are safe. Tune into KHQ Wednesday morning for the very latest, including live reports from Pullman on The Wake Up Show. LATAH COUNTY - The Latah County Sheriff says there is flooding around the county. He recommends that if residents don't need to travel on Wednesday they should stay home until crews have a chance to clear the roads and make sure they are safe. The National Weather Service has extended a flood advisory until midnight for the smaller rivers/creeks in the Pullman/Moscow area. PREVIOUS COVERAGE - The city of Pullman Police Department is asking people to avoid North Grand Ave. They say evacuation procedures are underway to help people get out of businesses and cars. Pullman Police ask those who don't need to go out to stay home and stay safe. Many roads in the area are closed until further notice. Paradise Creek and the Palouse River in Moscow are affecting Latah and Whitman Counties. The creek is already surpassed flooding stage and could reach moderate flood stages. Minor flooding is also expected near Potlatch, according to the National Weather Service. If Paradise Creek reaches 10 feet, water will be up to the homes near the intersection of Bridge and Hillcrest along with the intersection at 5th and Roosevelt will be flooded. MOSCOW - A flood watch has been issued for the Latah and Whitman Counties. Paradise Creek in Moscow is expected to be pushed past the flood stage of 9.2 feet, late Tuesday night and early into Wednesday morning. A sharp increase in rainfall is expected and according to the National Weather Service, there is a good chance the river will rise above the flood stage. The interception of Bridge Street and Hillcrest Drive may also be flowing into the intersection at that stage. Water could also begin backing up through the storm drains on Roosevelt street. WATCH: Latah County Sheriff - "If you don't have to go out, I just wouldn't go out.